Joe Patrice is an Editor at Above the Law. He previously practiced as a litigator at both Cleary, Gottlieb, Steen & Hamilton and Lankler Siffert & Wohl, representing a variety of individuals, institutions, and foreign sovereigns in criminal and civil matters. 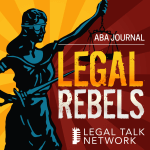 Joe is also a host on the Legal Talk Network podcast Thinking Like A Lawyer. The upcoming Above the Law Academy for Private Practice Conference, legal tech entrepreneurship, and how law firms can leverage new tech better. “Texas Law Hawk” Bryan Wilson talks about viral marketing in the legal industry and the power of branding. Are You Thinking Like A Lawyer Yet?